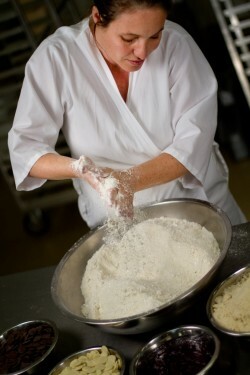 Claire Becker at work making her delectable works of art. 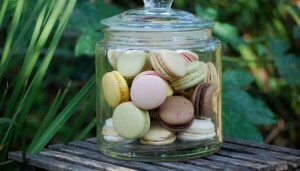 I’ve loved macarons since I first tasted the delicate almond meringue confection in Paris over two decades ago. Pronounced mack-ah-rohn, it is not to be confused with the coconut mound cookie (maca-roon). The macaron originated in Italy in the 8th century, and was brought to France during the 16th century by Catherine de Medici for her wedding to the future Henry II. It was later perfected in mid- 20th century France. Macarons became popular in the U.S. a few years ago when a prolifery of bakeries started serving them and they were coined the “new cupcake.” Even Starbucks got into the act for a short time. But not all macarons are created equal. First, macarons must have an evenly rounded top and bottom with the perfect balance of filling and cookie; second, when you bite or cut into the meringue “sandwich,” they should not fall apart; third, the taste must be sweet, yet fresh; fourth, the texture must have a perfect combination of a slight crunch that meets the soft center for a sweet burst of flavor. 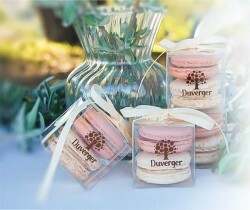 Duverger Macarons can even be ordered as a wedding cake. Claire uses only natural products and flavors, including buttercream or ganache made with chocolate; a fruit jam made with real fruit; and homemade almond paste. All the macarons are gluten-free. Longstanding popular flavors incude: Blueberry Lavender, Chocolate, Chocolate Orange Liquor, Coconut, Coffee, Lemon, Orange Blossom, Pistachio, Praline, Raspberry, Salted Caramel and Vanilla. And just last week, they introduced six new new flavors Earl Grey, Pina Colada, Rose, Honey Ginger, Passion Fruit and Choconut (with roasted hazelnut). Find Duverger online and in stores. Since their humble beginnings, Duverger moved their operations to Oxnard and has become the leading manufacturer of Parisian macarons in the U.S. and are available in stores and restaurants in 13 states. Locally, they can be found at Whole Foods Markets (20 locations); Monsieur Marcel (Farmer’s Market on Fairfax at The Grove and Beverly Hills) ; Aroma Coffee & Tea in Studio City; Mauro’s Café at Fred Segal West Hollywood; Café Los Feliz; Essential Chocolate in Culver City; and Treat Tea & Ice in Torrance. 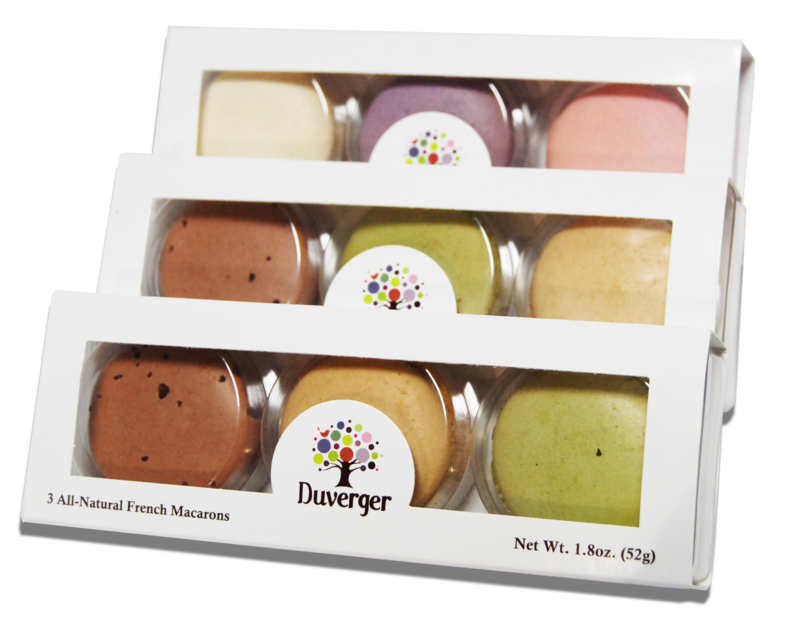 As of today (and just in time for Bastille Day on July 14), Duverger has an online store with gift packs of 24, buffet packs in three sizes — 72, 144, 188, and party favors where you can choose flavors and pick a custom color for the ribbon and logo. 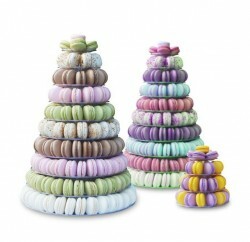 These macarons are not inexpensive as each one is like a little work of art. But, in the world of “you get what you pay for,” Duverger Macarons are a delightful addition to a party, a thoughtful gift, and a just little bit of Parisian decadence paired with tea or coffee. For more information about where to find Les Macarons Duverger or to order online, click here.